– 2.4 inch LCD to allow you to preview you photo directly. 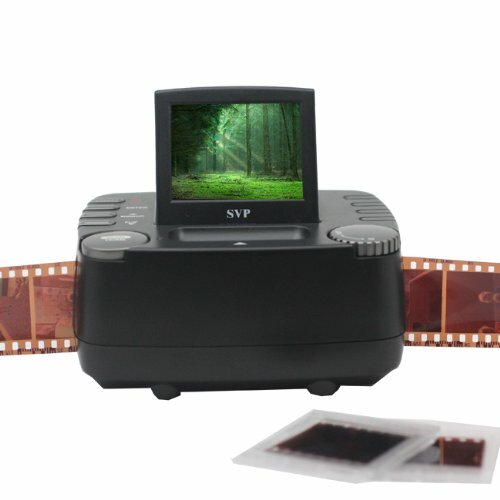 SVP 2-in-1 Film and Slide Scanner FS-1860 is a innovative standalone film scanner that instantly converts 35mm film negatives, slides into digital images without the need for a computer or application software. Now you can preserve all their photo memories by turning the millions of photographs now stored on slides and negatives into digital images to preserve them forever. We have created a very simple-to-use device that works right out of the box and produces a five-megapixel digital image in five seconds at a push of a button. FS1860 does not require a computer or learning a new software program, and it takes very little space to operate, store or transport. You can save your scanned photo directly in the SD card. With its petite size 4.8 inch X3.8inch x2.2 inch and light weight(less than 1 lbs), FS1860 is a perfect portable scanner you can take with you anywhere. Package includes the scanner, 1 holder for individual film, 1 holder for individual strip film, USB cable, power Adaptor, CD(compatible with Operating system Windows XP/Vista/7) and quick guide.